Chateau Dale Tha Bali. This low rise condominium of 5 storey is located on Thappraya Road, it is very convenient to go to Pattaya City or Jomtien beach. 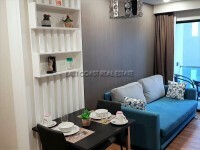 This large studio unit on the 2nd floor has a living area of 65sqm including the balcony. The unit is fully furnished, has 2 air conditioning, a fitted European style kitchen, a flat screen TV and a wardrobe. The complex provides a communal swimming pool plus a tropical garden, 24 hour security, key card access into the building, CCTV, cleaning service, Cable TV and Internet connection. There is Also Oasis Spa on the grounds. Available for rent with a minimum of a 12 month contract.